Mindfulness For Kids. It’s Not Boring. Really. Unless you’ve been living under a rock (or out in the woods on a decades-long Wilderdad adventure), you’ve probably heard that mindfulness is a thing. A big thing. It’s a big thing for adults, and yes, mindfulness is a big thing for kids. Do a quick Internet search and you’ll find mindfulness exercises for cooking, vegetable chopping, dishwashing, floor scrubbing, and even brushing your teeth. Every other day, another celebrity, business leader, or politician comes out to tell us they wouldn’t be where they were without their mindfulness and meditation practices. Even the US military has gotten in on the game, teaching soldiers how to train their minds to be more calm, relaxed, flexible, and resilient. So, of course, it’s not surprising that we’ve got a whole slew of material out there on mindfulness for kids. Maybe you’ve checked some of it out. Maybe you’re on the fence about it all. Maybe you just don’t think you have time for another activity. Well, let me tell you, teaching your kids mindfulness is well worth the effort. 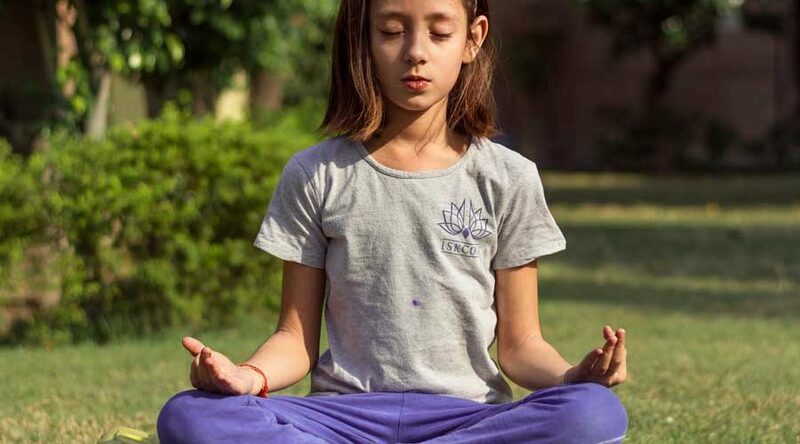 From developing more focus in the classroom to putting another handy wrench in the meltdown tool kit, a mindfulness practice will be a skill that your kids will use for the rest of their lives. Before we dive in to the “how-to” of the practice, let’s talk about the word itself. Personally, I don’t like using the word “mindfulness” when teaching kids. It just sounds too much like work. “Hey kids. What do you say we sit down on some cushions, close our eyes, and count our breath for a few agonizing minutes?” Yeah. Good luck selling that one. “Grounding” is another word that I’ve heard used but it’s still a little too adult-ish. Use that one and you’re more likely to get rolled eyeballs than relaxed and focused minds. Some people like to call the practice “being present” but that sounds like something Auntie Moonchild might say just before sage smudging the kids’ playroom to clear out the bad vibes. “Paying attention” is my favorite way of talking to kids about mindfulness these days. It’s direct. It doesn’t put on airs. And it doesn’t take that much to explain what it’s all about. That’s because that’s really all that mindfulness is: paying attention to whatever you decide you’re going to pay attention to at any given moment. That being said, here’s a few fun and simple exercises that you can begin to play with at home, at school, or in the great outdoors. Paying attention to auditory sounds is a great way to practice mindfulness for kids. You don’t even have to be sitting down to do this. You can do it in the car, at the park, or on a walk. Set your watch or timer for 1 minute and have your kids pay attention to all the sounds they hear. Once your timer goes off, ask them to list as many as they can remember. Now that you’re all warmed up, set the timer again. See if you all can pay even closer attention to the sounds that arise. Is that a dog barking in the distance? An airplane? A siren or car horn? How about birds singing, the leaves fluttering in the wind, or even the sound of your own heartbeat? See if you all heard more sounds the second time around. Visual sights are another great object for mindfulness and paying attention. We’re constantly seeing things from the time we wake up. But how much do we really notice? Set a timer just like you did for the listening exercise and ask your kids to pay special attention to everything they can see. You can keep this a general direction or hone in to something more specific. For example, you can just focus on colors. Or, if you’re on a nature walk, how many birds or animals you can see. If you’re in the urban jungle, identifying different types of cars can be fun, too. Finally there’s the tried and true mindful breathing practice. I know, I know. I just warned you how boring this was. But this version of the exercise has a few twists. Rather than just sitting quietly and paying attention to their breath, have the kids use basic shapes as finger tracing tools that help them stay engaged. 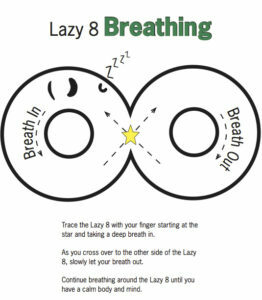 For example, you can use a circle to trace along with the in’s and out’s of the breath. Start with your finger at the top of the circle and trace counter-clockwise along with the natural flow of the in-breath. When you get back to the top, trace back clockwise as you follow the out-breath. Do this for a few minutes to begin with before gradually increasing the duration. A triangle can be used in a similar way. As you trace your finger along each of the three sides, quietly count to three on each side for the in-breath, holding the breath, and finally the out-breath. Again, set a timer for a short amount of time to begin with. 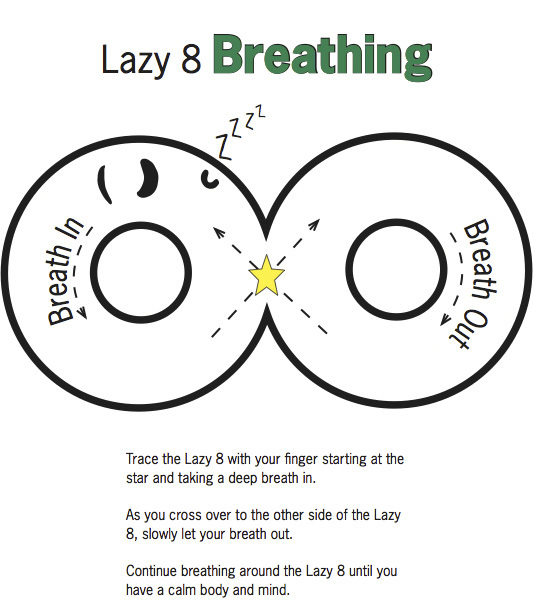 Using the same technique, the figure-eight is another shape you can use to teach mindful breathing for kids. Here is a diagram to illustrate. Check out this link from CopingSkillsForKids.com for a few more ideas on using shapes for your mindful breathing exercises. So, give all these exercises a try, gradually increasing the time limits on each. Experiment and modify them as you need. Come up with new ones with the help of the kids. See what works and what doesn’t in your particular environment and routine. The important thing is to remember is that paying attention (ok, mindfulness if you insist) is a skill. And like any skill, it takes time to get good at it. Stick with it and you’re sure to find that it helps you and your family stay more present (thank you, Auntie Moonchild), grounded, and calm for all of your adventures to come. Chris Lemig is an author, coffee-lover, and former Buddhist monk.He has spent enough years living in India, Nepal, and Tibet to add it as a 'wow-factor' to his various writer's bios. Chris is currently laying low in the Pacific Northwest where he is finishing his first novel and occasionally scraping his knees as he continues to trip and stumble down the path to enlightenment.